Published scientific studies document that humans who eat the most fruits and vegetables have much lower incidences of health problems. Few people, however, consistently eat enough plant foods to protect against common age-related decline. Consumers take dietary supplements to obtain concentrated doses of some of the beneficial nutrients (such as folic acid) that are found in fruits and vegetables. Commercial multivitamins, however, do not provide all the vital plant components that scientists have found are needed to maintain good health. 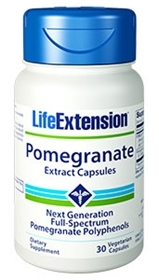 Due to overwhelming scientific evidence demonstrating the unique health benefits of the polyphenols found in pomegranate fruit, Life Extension has added standardized pomegranate extract to Life Extension Mix (tablets, capsules, powder) and Blueberry Extract Capsules. For those who desire higher doses, a stand-alone Pomegranate Extract and Pomegranate Juice Concentrate have also been formulated. Other ingredients: vegetable cellulose (vegetable capsule), dicalcium phosphate, magnesium stearate, silica. Pomella is a registered trademark of Geni Herbs.